Sun Media coverage of the current political state in the Maldives. All roads around the Republic Square has been closed off. After the protesters took a police officer hostage, Police have entered Lily Magu and rescued the captured officer. One protester was arrested during the incident. Six people have been arrested for disobeying police orders. They include the MDP activist, Naeema Mohamed (Naeema'htha). At the ongoing the press conference at the PPM Office, Azima has said that the Supreme Court ruling issued on 1 February 2018 was done so in violation of the constitution and so illegal court orders does not have to be executed. 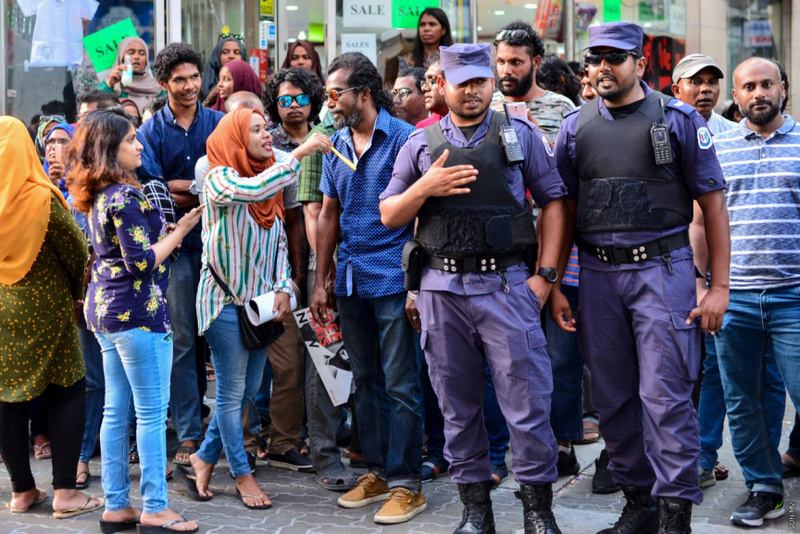 Azima Shukoor has said that police and MNDF will secure public safety through securing the streets and the government will implement the Constitution. Legal Affairs Minister at the President's Office, Aishath Azima Shukoor has said that the police and MNDF will not allow vandalism and attacks on law enforcement officers. Protesters gathered on Majeedhee Magu has been dispersed to different areas. Not many are gathered at one place. Police has arrested the Head of Programs at Raajje TV, Amir Saleem as well. Raajje TV Journalist, Mohamed Visam. Protesters have been pushed back up to Maaveyo Magu. Vice President of PPM, Abdul Raheem Abdulla (Adhurey) has said that the money owed to the state by the JP Leader, Qasim Ibrahim, is being spent to overthrow the government. 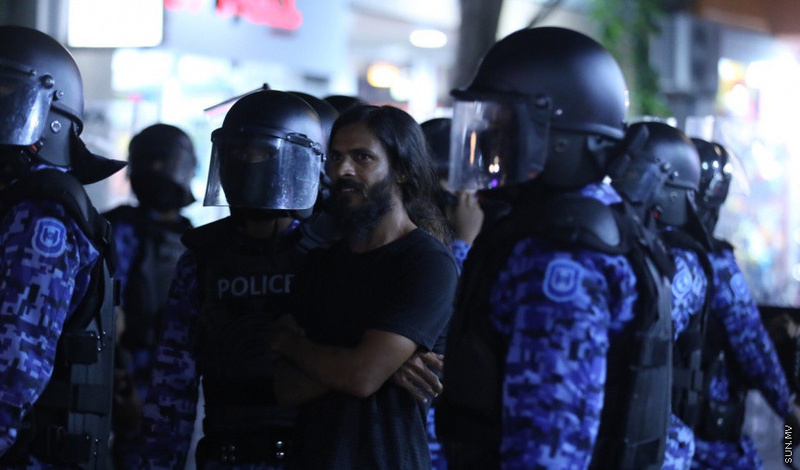 Raajje TV Journalist, Ahmed Fazeen, has been arrested inside the protest rally. Police are working to push back the protesters. MP Nihan has called to the opposition to put an end to the protest rallies if nothing has happened by the end of the night. MDA's Vice President, Mauroof, has called to all the religious scholars to defend the nation. Vice President of MDA, Ali Mauroof has said that no Maldivian citizen would accept giving way to another religion aside from the Islamic faith in the Maldives. MP for Vilimale' constituency and Leader of the PPM Parliamentary Group, Ahmed Nihan Hussain Manik has said that videos are being made in connection to the police and MNDF are to create a rift between the two. Police is arresting a lot of people from the protest. It is unclear how many people have been arrested so far. Maldives Police Service is advising the protesters to leave the area. Police said that they would not be responsible for any injuries or damages when they disperse the rally. 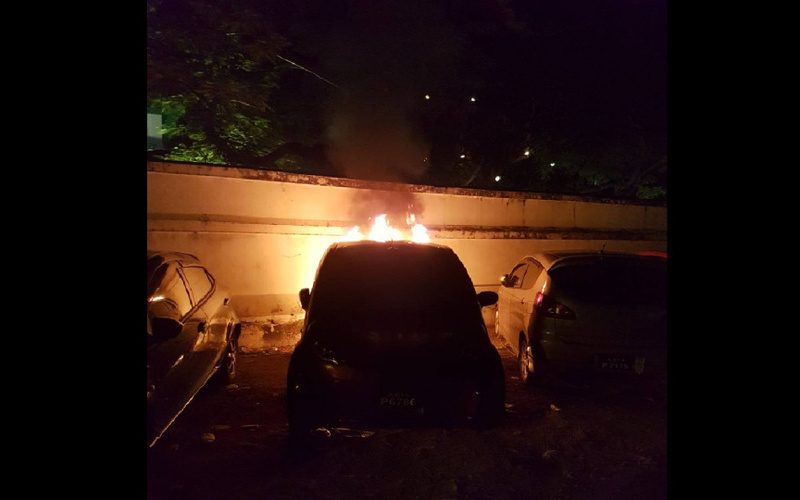 A car at the parking zone near the Islamic Center, at the former office of Dhiraagu, has been set on fire. MNDF said that a fire set to a car near the Museum was reported around 8:05 p.m. tonight and the fire has now been extinguished. A car near the Islamic Center set on fire.